Within Instrumentation Technologies, we deliver a full suite of solutions and services to a worldwide market in healthcare and medicine, IoT, smart cities, telecommunications, aerospace, university research and development and government sectors, in order to help customers quickly realize their product’s potential from design, development and certification to launch. Furthermore, we are the global leader in the field of instruments for beam position processing and beam stabilization at particle accelerators and our Libera products are used worldwide by scientists, who demand technological perfection. Within Biopharm.si we are working on project RRP 2 and RRP 3, developing a low-cost Raman spectrometer as a tool for pharmaceutical and biological research. Raman spectroscopy is one of the most important tools used in different fields such as physics, chemistry, biology, pharmacy etc., and it relies on phenomenon known as Raman scattering. Raman scattering was named after Indian physicist C. V. Raman who discovered this phenomenon in 1928. Raman scattering, or inelastic scattering is used to observe vibrational, rotational, and other low-frequency modes in a system (1). More details about Raman spectroscopy and Raman scattering can be found in (2, 3). Getting the Raman spectra is a challenge since the probability of Raman scattering decreases rapidly as the excitation wavelength of the laser increases (the dependence is inversely proportional to 1/λ4). There are many possible wavelengths which can be used as a source for the Raman instruments, however the most common ones used in commercially Raman spectrometers are 532 nm, 785 nm and 1064 nm. The main reason for using different wavelength instead of one, is to avoid fluorescence, which is interfering with the Raman spectrum. Very nice comparison of using different wavelengths for different field application is given in (4). To make a robust VIS-NIR low-cost Raman spectrometer for different applications including those related with pharmaceutical industry, the wavelengths of 532 nm and 785 nm have been chosen. The schematic of proposed spectrometer and the list of the components are given in Figure 1. Figure 1. 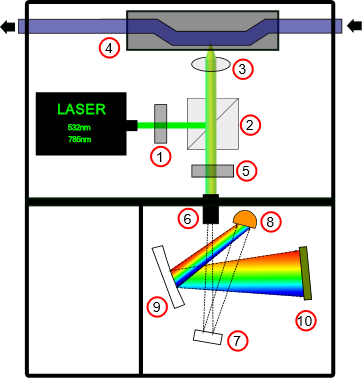 Schematic diagram of proposed Raman spectrometer. The excitation light of 532 nm or 785 nm passes through the bandpass filter (also called laser clean-up filter) and refract on the dichroic laser beamsplitter. The beamsplitter reflects a standard laser line incident at 45° while efficiently passing the longer Raman-shifted wavelengths. Light reflected from the beamsplitter passes through the focusing lens or microscopic objective and hit the sample. Reflected light is mostly longer Raman-shifted wavelengths which passes back through the beamsplitter and notch filter and reach the slit. The slit is critical to the spectrometer’s performance and determines the amount of light that enters the optical bench and is a driving force when determining the spectral resolution (5). The light than reaches the optical bench of the spectrometer which is in our case the crossed Czerny-Turner optical bench. There are many different possible optical bench configurations, the three most common types are the crossed Czerny-Turner, unfolded Czerny-Turner, and concave holographic spectrographs. With a known angular dispersion value of the diffraction grating, the focal length of the two mirrors are designed to provide various linear dispersion values, which in turn determines the spectral coverage for a given detector (5). In this optical configuration one mirror is a collimating mirror and another is focusing mirror. Figure 2. Block diagram of proposed data acquisition system. The block diagram of proposed data acquisition system is given in Figure 2. The concept of the device is based on the requirements described in Biopharm.si project (RRP2 and RRP3). Once the Raman spectra is collected, the data can be shown directly on the user’s computer or web page. The system design allows user to operate with the Raman spectrometer remotely and to collect the data instantaneously. The final design aims to allow user to easily change the laser source and to use the spectrometer for in-line (using the probe) and/or on-line and at-line (using the cuvettes) measurements. So far, the first tests have been made by using 532 nm with samples such as: Acetone, Acetonitrile, 2-Propanole and 96% of ethanol. The Raman spectra of Acetone are given in Figure 3 including Raman spectra obtained with Kaiser RamanRxn2 with bio-pro Raman probe, Ocean optics USB4000 spectrometer combined with our 532 nm laser and Instrumentation Technologies Raman spectrometer (ITRS). As can be seen, the Raman spectrum of the Acetone obtained with ITRS shows very good results in comparison with much more expressive and much more sophisticated Kaiser RamanRxn2. On the other hand, the Ocean optics USB4000 shows lower resolutions and wither Raman lines due to diffraction grating chosen for this spectrometer. Figure 3. 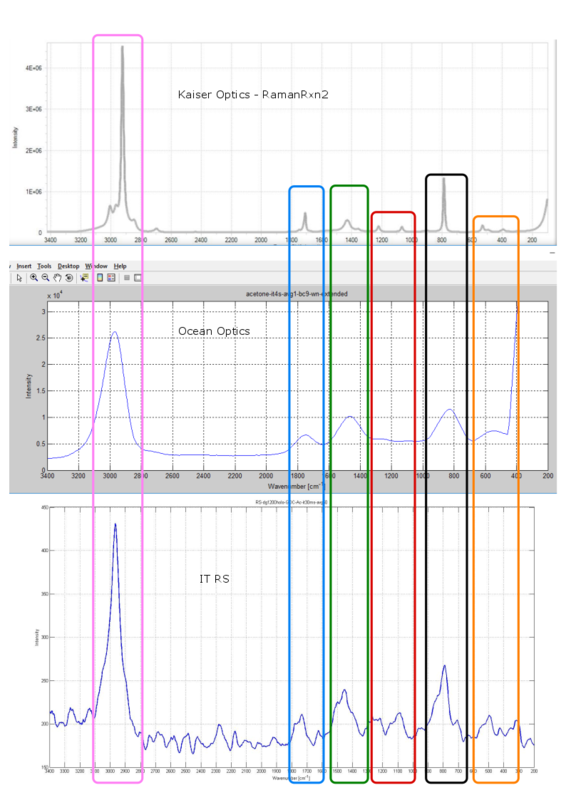 Raman spectra of Acetone obtained with Kaiser RamanRxn2 with bio-pro Raman probe (top), Ocean optics USB4000 (middle) and Instrumentation Technologies Raman spectrometer (bottom). Further development of the Raman spectrometer will include tests with the biological samples obtained from Biopharm.si partners COBIK and LEK. Both 532 nm and 785 nm wavelengths will be used in these tests in order to observe the fluorescence influence on the spectrometer and finally to get the Raman spectra of biological samples. Gardiner, D.J., ”Practical Raman spectroscopy.”, Springer-Verlag. ISBN978-0-387-50254-0, 1989. Raman spectroscopy, https://en.wikipedia.org/wiki/Raman_spectroscopy#cite_note-Gardiner-1, web page visited in May 2018. Introduction to Raman spectroscopy, http://www.horiba.com/scientific/products/raman-spectroscopy/raman-academy/raman-tutorial/, web page visited in May 2018. Aleksandr V. Mikhonin, Susan Hodi, Laurence A. Nafie, Rina K. Dukor, ”Recent Developments in Handheld Raman Spectroscopy for Industry, Pharma, Forensics, and Homeland Security: 532-nm Excitation Revisited”, Volume 31, Issue 6, pg 46–52, Jun 2016. Spectrometer knowledge, http://bwtek.com/spectrometer-part-1-the-slit/, web page visited in May 2018.